A great time was had by all at the Afternoon Tea Dance run by a Swing Patrol teacher who looked as if she’d walked in from the 1940s. 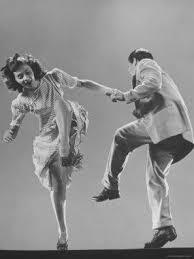 The photo above approximates to what we learnt: Lindy Hop, to music by ‘Ain’t No cure for the Somers Town Blues’ live. We’ll be doing this again at the Somers Town Festival July 14th and in the meantime come to our next event on the 21 June – Women of Somers Town! at Basil Jellicoe Community Hall.